In a move to reduce militancy in Jammu and Kashmir, the state’s Home department has come up with draft surrender policy for militants, media reports claimed. After a directive from the government, the policy by the government has tweaked its surrender policy to encourage more defections from militant ranks in a bid to reduce militancy in the state, a report by Defence News said. As per reports, 250 militants were arrested in 2018 but another 200 are active and a majority of them are locals. 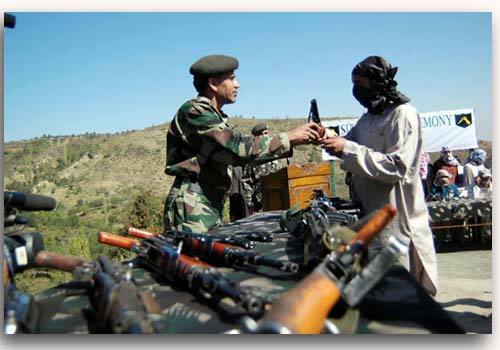 Alarmingly more than 100 odd youth were recruited by militants last year, the report mentioned. Those militants on the list of Subsidiary Multi-Agency Centre (SMAC), a centralised agency for security and intelligence inputs, will now be eligible for incentives under the tweaked policy. As per the fine-tuned policy, the militant surrendered will be called “renouncer”. Those who will surrender will do so only before divisional commissioners, district magistrates, top police officers and heads of operational units not below the rank of Commandant. The “renouncer” will be eligible for a fixed deposit of Rs 5-6 lakh which will be available to the renouncer after a lock-in period of 3 years, the report claimed. “The objective is to offer an opportunity to militants who eschew the path of violence… The policy is particularly aimed at economic rehabilitation, enabling them to lead a normal life and contribute towards society’s progress,” read the draft policy by the Home Department. As per the draft policy, the “renouncer” can enrol under Pradhan Mantri Kaushal Vikas Yojana (PMKVY) to seek self-employment, Defence News reported.